This new set of three pouches is designed to stylishly accommodate all organization needs. 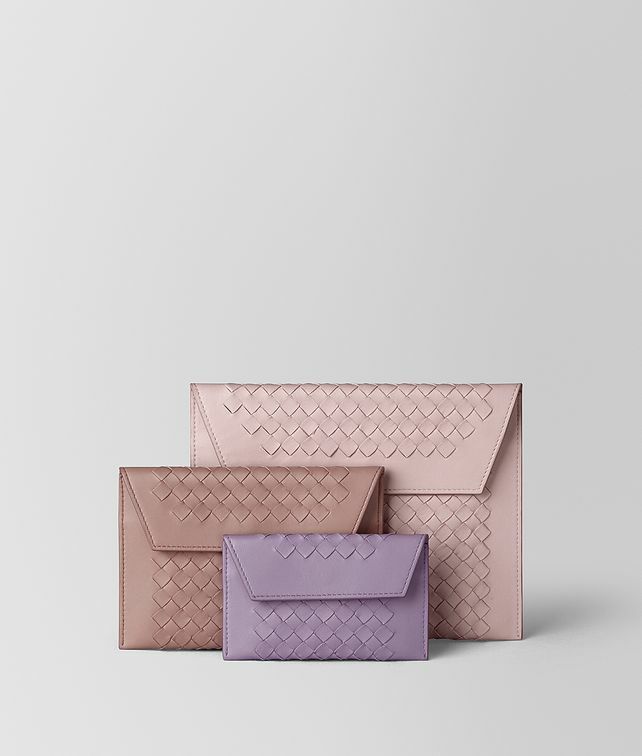 The large envelope can be used for documents or makeup; the medium size pouch for a passport or receipts; the small case is ideal for cards or coins. They are crafted in the Intrecciato Checker workmanship using the new “inserto” style which frames the woven section with smooth leather. The envelopes fit perfectly inside one another for easy storage. Each one has a button closure. Large Pouch: 17 cm x 22 cm | 6.7" x 8.6"
Medium Pouch: 12 cm x 17 cm | 4.7" x 6.7"
Small Pouch: 8 cm x 13 cm | 3.1" x 5.1"